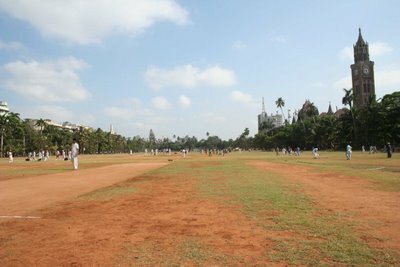 A few days ago I was at morning cricket nets at the Oval Maidan in Bombay, a weekly affair where we exercise our two-bit skills with high seriousness and fidelity to ritual. Not far from where we were playing a bespectacled young man, clad in a tracksuit and a cap, was conducting some summer cricket coaching with a dozen boys in whites. Caught up with the mechanics of trying to bowl an outswinger correctly, I soon forgot all about them. But a little later, while chasing down a hit, I happened to come across the scene of a standard fielding drill taking place. The man had lined all his wards up, and was hitting balls towards them. They were supposed to run up one by one, field the ball and throw it back, and return to the back of the line. Unsurprisingly it was the coach himself who seemed most enthusiastic- all kids think of is bowling or batting. He hit the ball and shouted, in a tone meant to gee up the kid, "Come on, get it, it's yours!" But the boy running towards it seemed unable to turn his speed up a notch; in fact he had a struggling, striving air, like a butterfly fighting against a breeze. He was being held up by his shoes, which were clearly two or three sizes too big for him - perhaps hand-me-downs from an older brother or cousin. As he ran in they seemed somehow to have a life of their own, independent of the feet inside them. He stopped the ball a little sheepishly, returned it, and ran back. But no great tragedy need be read into all this. If the boy was slightly embarrassed, he was still happy and "switched-on", pursuing his dream, even if in shoes two sizes too big. I've been going to nets for about three years now, mostly at the Oval and the more crowded Cross Maidan (where a small rectangular patch of land has a dozen pitches). The young cricketers playing all around me, and playing for reasons very different from mine, are mostly teenagers from middle- or lower middle-class backgrounds. In all these years of observing them I feel I understand something - in fact it is difficult not to be struck by it - of what cricket means to them. Actually one needs to say no more than just this: cricket means something to them. It means something when very little else in their lives means anything, and this overpowering preeminence of cricket in their lives is not merely because of the magic of the game and the impassioned blinkers of youth (think of the boy Tendulkar, going from match to match on his coach's scooter, and of all the other boys who must have done similar things, if not to the same end) but because everything else in life is so profoundly dull and uninspiring. Education, for instance, which serves in theory to free us, to make us more aware of ourselves and what we want to pursue, is almost everywhere in our country a bad joke, a set of dud formulae to be remembered and meaninglessly regurgitated. Where it should teach us to take an interest in the world, it renders the world opaque. Who can take any pleasure in school other than that of japes and camaraderie with friends? There is very little about life in these training-grounds that allows us to dream, glimpse a way forward for our lives. But cricket - there is a spark in it that immediately rouses ambition and competitive spirits, that gives meaning and purpose to constrained lives. To play cricket is to wake up. On the field one lives fully, intensely, relying on one's wits from moment to moment. In the angle of one's bowling arm, or the calculation of which ball to play and which one to leave, lies the very same maths problem that induces such sleep in school. For this reason, even if few of these kids go on to become cricketers of any standing, cricket is good for them because it serves as a beacon in their lives. While most other fields in life lie fallow, the maidans, at least in the imagination, are always green. It seems to me that kids who play cricket seriously, whether they play badly or well, learn something about themselves and about life that many others don't. And yet of course, as one grows older, reality checks in, and other problems and issues present themselves, cricket is usually left behind. Just as on the Oval maidan the heat is fierce and the dust flies thickly, and even shiny new balls become cracked and chapped in a few minutes of use, so the demands of adult life, too, overpower people over time. And sometimes on the train or bus one sees people who one feels must have once been those very same boys playing at Shivaji Park or at the Oval, only ten years older now and disabused of the lifegiving illusions of adolescence - still with a bit of fire in the eyes, but undeniably wearied, haggard and disenchanted. Cricket is over; many other things have taken its place. I agree with your points on the importance of cricket for youth. But in addition to freeing the mind and teaching a fair bit about life, as you pointed out, there seems to be a Horatio Algeresque aspect to the game when a big player or two suddenly come up from rural backwaters that provides plenty with hope. From being a game for the upper echelons of English society during the Empire, it's turned into something for people of all socioeconomic classes and a bridge. One only needs to look at people like MS Dhoni, from the backwaters of Jharkhand, Steve Waugh, a Bankstown boy from a large middle-income family, or others like Vinod Kambli and Sanath Jayasuriya. Cricket means a lot to plenty of people, a number of whom play it solely for the love of the game and the joy it brings. But what about those who take it a little more seriously and look at it as a way of moving up in life, by breaking into a Ranji or Duleep Trophy squad - or perhaps, like Sreesanth or Munaf Patel, into the national team? I swear I left a comment here. Totally inoffenive. Useless? Maybe. I don't meant to question your judgment on your blog, but I wonder why was it rejected. like rides on a scooter and shoes two sizes too big. Your analysis returns cricket to the realm of lived realities, and shows how the drama of the game isn't only the contest between bat and ball--but primarily between ambition or the desire for escape and everything that at each moment threatens to thwart it. Thank you. Amitava - Thanks very much. As you are the biggest luminary ever to have left a comment on the Middle Stage, you are cordially invited to lunch at Noor Mohammadi the next time you are in Bombay. As you are such a luminary (the biggest luminary ever to have left a comment on the Middle Stage) you'll be paying, of course. And yes, that's a very good way of putting it: "the desire for escape and everything that at each moment threatens to thwart it". That's it exactly. Confused - Yes, I did get your comment, and there was nothing offensive about it. But I chose not to publish it because it compares me unfairly to a much better writer on the subject. While I am a highly immodest soul, I do also occasionally see the truth for what it is. Anyway, to mollify you, I have plans of soon running a long interview with the gentleman in question. I apologize if you thought I mentioned the said gentleman in a flippant manner; that is why I said ''in the making''. Rest assured, I have the highest respect for him. Interview-that will be a pleasure to read. Look forward to the interview. Confused - of course I'll buy you a lunch. In fact I owe all my loyal readers lunches, but only at Noor Mohammadi. Just email to fix the date and time and I'll turn up. Life is nothing if not salted by good food and conversation. Only some topics are off-bounds, such as Tendulkar's loss of form, the Sourav Ganguly affair, or the ICC and how it is ruining the game, or the present state of world cricket. Pleasure and instruction, true. Courage, concentration, competitiveness, perseverance, but not as abstract qualities - when the dream disappears, they become meaningless. I myself am a lazy, irresponsible dilettante. That's why academics have always appealed to me. Armchair cricket, and stats. I think you said it well about education and the gap it leaves in the minds. Thank god for cricket!! All sport is a wonderful medium to learn life's lessons, dont you think?